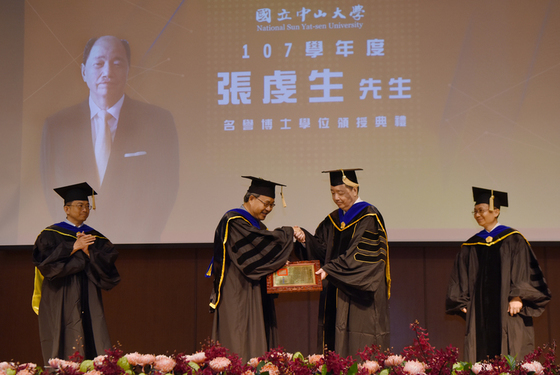 ASE is pleased to announce that Chairman Jason Chang was presented the Honorary Doctorate Degree by the prestigious National Sun Yat-sen University in honor of his entrepreneurship and extensive contribution to the semiconductor industry. NSYSU is consistently ranked among the top Asia Pacific business schools. The university has collaborated with ASE in advanced packaging technology, manufacturing automation and corporate sustainability. Over the years, the academia-industry collaboration has promoted student engagement and developed innovative technology suited to the industry. It has also given students the opportunity for interacting with the business environment that will benefit them in their future job placements. Jason founded ASE in 1984 together with his brother, Richard. They established the first facility in Kaohsiung, Taiwan with only 200 persons. The Kaohsiung campus has since grown to a headcount of 26,000 employees, while globally ASE has over 93,000 employees. Jason’s passion for technology and innovation was also reflected in his constant pursuit of cost-effective solutions for the industry. In 2015, Jason received the SEMI award for his successful commercialization of copper wire that has enabled the development of affordable and high performance consumer end-products. Jason believes firmly in human capital and is committed to cultivating talent across the organization. In recognition of his focus and commitment, Jason was presented the Dale Carnegie Leadership Award in 2017. As the Chairman and CEO of the world’s leading semiconductor manufacturing service provider, Jason has inculcated in his team the value of sustainability and corporate citizenship. For three years in a row (2016, 2017, 2018) ASE was selected the industry leader and included in the Dow Jones Sustainability Indices. The management and employees at ASE are incredibly proud of Chairman Jason Chang and congratulate him for his stellar achievements.